Afilm set is a unique world that has to be experienced to be understood. There is a steep learning curve that comes with every film production. It can take many years before anyone is completely at home on set, and many more to become a master at the chosen craft on any crew. But not everything on a film set is a trial by fire. We’ve put together an essential list of some of the most widely used film terms on working sets. We’re taking some of the mystery out of joining a film crew so that, whether you’re a newbie or a seasoned pro, the lingo won’t trip you up! Here’s your essential guide to film terminology and, at the end of the article, etiquette that every cinematographer — and really every production professional — needs to know. Instead of an alphabetical glossary, we’ve broken this list down strategically by department and sub-department. Read it from start to finish to get a solid foundation of basic movie terms. Know what stop you’re on? An F-Stop is the number that measures the width of the aperture on the camera. Actually, it's a ratio of the focal length to the diameter on the sensor or pupil. It is also known as focal ratio. F-Stop determines depth of field and the amount of light entering the lens. So is there a difference between F-Stop and aperture? Just remember f is for focal … length. Furthermore, T-Stops are more precise measurements and are commonly used with high-end lenses. What's the difference between the F-Stop and T-Stop? The F-Stop represents the theoretical value of light entering a lens in relation to the lens focal length. The T-Stop, meanwhile, is the true value that transmits through a particular aperture setting. The T stands for transmission. It's expensive and requires a lot of time to conduct tests and determine T-Stop values, which is why many lenses settle for F-Stops. But high-end professional cinematography lenses typically rely on T-Stops for greater accuracy. 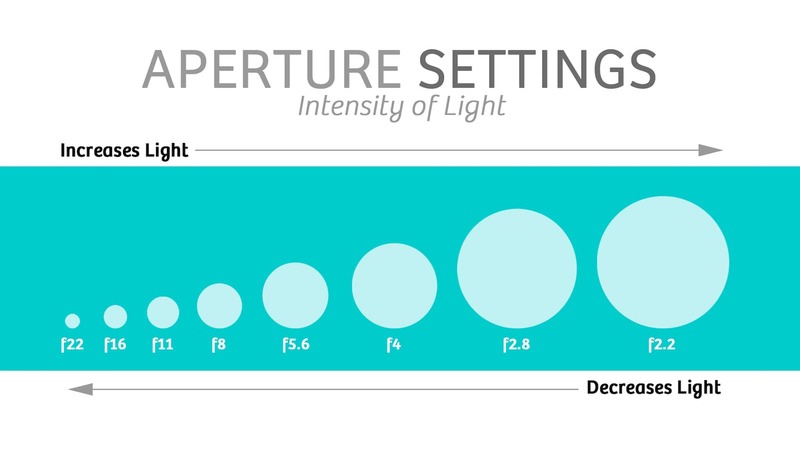 For a deeper dive, check out our complete guide to focal length. Local 600 is the International Cinematographers Guild. It is a collective bargaining association which represents more than 8,000 camera department-specific workers world wide. The Guild is an offshoot and department of the International Alliance of Theatrical Stage Employees (IATSE). This Local, of course, is specific solely to the camera department. Though, if one department on a film set is union, chances are they all are. Every cameraman wants to be in the union, the benefits are that good! Rack Focus is the movement of lens focus from one subject to another within a shot. It is usually done in a creative or stylized manner. The length of the rack can vary from shallow to deep, offering more grandiose to more subtle effects, respectively. Pulling focus is the constant adjustment to keep images in focus. The Focus Puller is one of the most important jobs in the camera department. It's a role that requires training and technique for proper execution. The focus puller is also usually called the 1st AC, or first assistant camera. Plainly, this is the person on set who pulls focus. Gaffer Tape is a cotton-based, pressure sensitive, heat-resistant adhesive used on film sets, usually coming in an array of colors. To gaff is to apply gaff tape, with the action taking its name originally from the tape itself and the crew member most likely to use the expendable. Did you know there are at least 50 uses for gaffer tape? On set, gaffer tape is often used to fix wires and cables to a surface, such as the floor or furniture, for safety or concealment purposes. A catchlight (also catch light, with a space in the middle) is a light source that results in a specular reflection in the eyes of the subject. The catchlight is also known as an Obie, after Hollywood actress Merle Oberon. The technique was first invented and referenced by Oberon’s husband, Lucien Ballard. It’s said that Ballard wanted to draw attention to a special glimmer in Merle's eyes to distract viewers from scars she'd suffered in a long-ago automobile accident. Many filmmakers look to the eyes as point of focus, and a catchlight gives the eyes a little extra pizzazz, a sparkle. The catchlight is typically a designed, intentional effect, but sometimes it occurs unintentionally. An Electronic ViewFinder is a device used to compose shots where images taken from the lens are electronically projected onto a monitor or display. An EVF is often used to focus shots and can be used in conjunction with the camera itself. The non-electric version is the Optical Viewfinder which is what most people are looking into when looking into the lens of a camera. With the optical viewfinder, the light reflects off a mirror and through a prism to display an image. CTB Color Temperature Blue and CTO Color Temperature Orange are gel filters. CTB and CTO are commonly used to alter the color of light output or temperature. CTBs and CTOs are often used in lighting design, television, cinematography and photography. Using CTB/CTO gels are a form of color correction accomplished during physical production. The gels change the color temperature in the scene, setting or on the subject but does not disrupt the white balance. A Western Dolly is a large, heavy duty platform, longer and wider than those used as a standard dolly. Can you tell the difference between doorway or western dolly? A Doorway Dolly is the small and versatile sibling of the Western Dolly. A Doorway Dolly is considered a more standard dolly. Kino Flo, also Kinoflo (with no space) or kinoflo (lowercase) is a company whose main objective is producing light for film, television, and theater. The name kino has become nearly synonymous with the lightbank kits professionally referred to as "diva kits." Sort of how Kleenex is a brand name for tissues, also known as, well, kleenex. Or how Band-Aid is a brand name for ... band-aids. The term kino is derived from the Northern European and Slavic terms for Cinema. Just to make things extra confusing, Kino is also the company name of a film distributor in the United States, and it's the name of a famous old movie palace in Berlin (Kino International). A chimera is a piece of film production equipment used to achieve soft lighting. It is one of the most important tools in a filmmakers arsenal. The chimera is technically a lightbox and can come in the form of many different shades or fabrics. Each lend a certain quality depending on how they are used and when. Expendables are any of the secondary or support equipment, supplies or products necessary for use in film production. Expendables are most heavily associated with the camera, grip and electric departments. However, expendables can have universal applications, from gaff tape on the production desk to a compressed air canister used to clean a keyboard or the gate of a film camera. The martini shot is the very last shot (set up) of the day. It is believed to be named after a beer campaign from the early 80s (“It’s Miller Time …”) that recognizes a classier cocktail benefiting the entire film production. Along the same lines, Abby Singer is both a 1st AD and a film production term that refers to the penultimate, or second-to-last, shot of the production day. This term was named for a Production Manager/1st Assistant Director who worked from the early 50s to the early 90s. “Abby Singer” reminds the crew that they are not done quite yet but soon will be. Video Village is the staging area of monitors connected to the camera feed(s). Usually reserved for those on the production who will have a say in the outcome, but don’t have any technical experience for achieving, the looks wanted. Video Village is generally composed of a seating area and viewing area. It was devised as a way to keep the action of the staging area free of extra personnel. It is also a place for the script supervisor to work in tandem with other department heads to perform continuity assurances and last looks. Sarah Jones is one of the most recent additions to film production terminology. Saying the name Sarah Jones is an invocation to remember onset safety procedures. This term is both an homage to, and reminder of, a fearless member of the camera department. Equally, it is a reminder that safety is the most important thing in production. Sarah Jones was a camera assistant who lost her life because of negligence on set. Her untimely passing is invoked on set when any situation demands reconsideration of the safety of any action in production. The tragic passing of Sarah Jones led to a renewed emphasis on safety on film sets, and prompted the creation of the Sarah Jones Film Foundation. A C47 is a clothespin. The term is often used to test the neophyte's familiarity with the workings of production and on set. Nevertheless, a C47 is another term for clothespin. Knowledge of the term outside of the grip department is used almost solely to infer a person’s comfort on set. In the golden days of Hollywood, the term C47 was first used to mask the cost and need for such a ubiquitous piece of equipment on the film's budget. No producer will spend good money on clothespins, for crying out loud, but a producer who doesn't know much about technical film terms won't hesitate to pay for a bunch of C47s. Film terms are any words or phrases used in film and television production that have evolved over the life of the industry. A general knowledge of film terms is necessary for moving up in any department on a film set. Many are used to suss an individual’s familiarity with a department, the film set or the industry itself. Here, are a few examples of some film terms that are most common to every set. However there are an endless number of film terms one should learn and know very quickly. When either talent or crew is in the loo. To use a reflector or other equipment in an indirect way to light or highlight talent being photographed. “I understand that” in on-set walkie lingo. When a member of the crew passes through a hot set. A call to every department that the camera department has finished its’ preparation and the scene is ready to be filmed. A slate taken at the end of the scene rather than the beginning. To take away a piece of equipment usually lights. This is used to ask where someone is currently located. If you are already in the camera department or a director of photography there are many things that you may have learned in your time on set. Every set is different and therefore every crew member has come across their knowledge in a very specific way. There are plenty of manuals for lighting equipment, but there aren’t so many on how to lead your department. Most DPs will have had plenty of mentors as they worked their way up the ladder on set. But if you are new to having a crew, by all means read about, ask about or even mimic what you’ve seen before. Just in case you came up on a set that was out of the ordinary or very specific to a long term project, here is our refresher. Follow on set meal time etiquette. When lunch time finally arrives, it can seem a bit like a high school cafeteria. There is a preordained order to where one sits at meal times and usually it is by department. This is a good rule to follow if simply to discuss the workflow of the day and what work needs to be done. Also, when lunch is called, everyone gets in line to eat, usually by position. See where you are on the call sheet. The call sheet is a good determination of where you and the crew should stand in line unless specifically directed otherwise. When the AD calls "last man" the clock will stop for half an hour. Thirty minutes later you’re "back in" (on the clock). This has more to do with union regulated meal times and should be observed religiously. If you see talent or department heads at the craft services table, do not look at this as an invitation. They may very well be working on the run. It isn’t necessarily a time to chat or network. What do you call the talent? For starters, don’t call them anything. Remember they are often times there to play another character or be in another emotional headspace than you may be used to seeing them in. You cannot take it personally, you cannot proactively engage. They are working when others are not. Let them be your guide and still tread lightly. Speak to the 1st AD if you have questions that will involve your work. Show your crew how to behave. Say "hello", introduce yourself and get to know people a bit before you give orders. Ask about the families of people you know. Use given names...or be formal. Furthermore, give credit for trying. Do mention “My Crew…” to any one and they will know you mean your department and its’ welfare. Your crew will look to you and the other department heads to see what is acceptable and appropriate behavior. Remember, you only get one chance to make a first impression to your crew. Whether the camera is running or not, even if no one is doing anything of note, you must ALWAYS know where the camera is. No one can do anything without the camera — whether it is tiny or large, expensive or less so. Ultimately, that camera is the reason everyone is there. The primary responsibility of the camera department is to insure the safety of the camera. You must know who has the camera, why, and for how long? This is true in a literal as well figurative, or storytelling, sense. Camera placement is the reason the DP is on set. What’s the camera got to do with it? Communicate your responsibility and goals to the crew before shooting starts so everyone on set is on the same page, both creatively and technically. You will do this with shot lists. You will do this with storyboards. You might even do this with mood boards. Luckily, this is much easier today than it has ever been. Before you get on set, the senior members of your crew should know what’s the main objective for what you are shooting that day. In addition, your team will often want a heads up regarding the next day’s shoots. Anything relevant to the shoot, whether it be company moves, an extra long day, a short lunch, special gear or equipment needed, should be communicated as far in advance as possible. Discretion and diplomacy are very important on any set. The criticisms or observations that you offer can be infectious. You don’t ever want to be known as the “negative Nellie” on set. If you have something pertinent to whatever you’re shooting, make sure you’re speaking to the right person. Maybe even remember what they say to children in situations when you don’t know whether to speak up or not: is it true, is it necessary and is it positive? There is nothing worse than a member of your team being half way out the door and you have not finished shooting yet. This is doubly true for any department head. It is demoralizing at best and poor work ethic at worse and a good way not to be invited back to the team. Don’t touch any other departments equipment. This should go without saying for everyone on the set. Everyone has their own job to do and it will never be helpful to touch equipment, crew or anything that isn’t specific to your department. In the same vein, no one should be touching anything in the camera department without express permission. Damages and thefts happen on many sets. Don’t tempt the fates. Be still during takes, no matter how much you need to 10-1 on set. Do not move at all if you are in view of where the shoot is taking place. A fidget or sudden movement can really distract the focus of the scene from an often times very calibrated performance. Even sensing someone wiggling uncontrollably during a take could steal attention away and cost the production a take. There have been some public examples of how talent can react in this situation. None of them are good. Again, do not move equipment or anything once someone yells action. There are many lessons to be learned on set over the course of a full career in Hollywood. Knowing the basics will definitely give you a leg up once you find yourself leading your own department. Everyone starts somewhere and more than likely it was at the very bottom of the on set pecking order. Treating everyone with respect, remaining curious and inquisitive, and being true to the craft you’ve undertaken, are the most important actions you can have. Perhaps you’ll one day be so at home on a film set that a new film term will be coined in your honor. Now that you know how to behave on set, it’s time to up the ante. The best way to become a better filmmaker is to study the masters. Read up on one of the best cinematographers of all time. Get tips, preferences, and insights you won't find anywhere else. Learn from Roger Deakins.